Investigating the Canon of Proportions, Part 1 (Elementary) – Through observation and measurement, students will work with the system of ideal ratios found in the writings of Leonardo da Vinci to compare nature with art. Investigating the Canon of Proportions, Part 2 (Intermediate) – Through observation and measurement, students will work with the system of ideal ratios found in the writings of Leonardo da Vinci to compare nature with art. Analyzing and Writing Renaissance Sonnets, Part 1 (Elementary) – Learn about the Italian sonnet form and interpret a sonnet by Petrarch. Analyzing and Writing Renaissance Sonnets, Part 2 (Intermediate) – Analyze a fifteenth-century work of art and brainstorm ideas for recreating it in sonnet form. Analyzing and Writing Renaissance Sonnets, Part 3 (Advanced) – Write an original sonnet inspired by a fifteenth-century work of art. Ancient Artifacts: Trash or Treasure? Part 1 (Intermediate) – Research and defend in a classroom debate three contrasting attitudes toward classical antiquities in fifteenth-century Italy. Ancient Artifacts: Trash or Treasure? 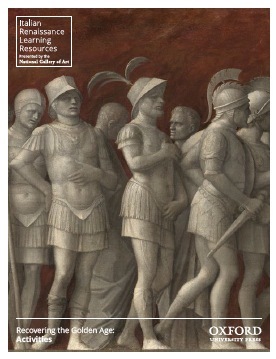 Part 2 (Intermediate) – Research and defend in a written essay three contrasting attitudes toward classical antiquities in fifteenth-century Italy.